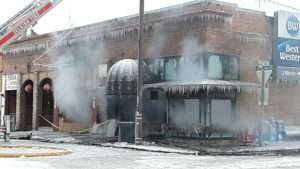 Firefighters continue to douse the building at First Ave. and Bridge St. with water at 8 a.m. Monday morning after a fire was reported at 1 a.m. Photo by Ben Olson. The Sandpoint community reacted with heartbreak and condolences Monday morning to the loss of five local downtown businesses in a fire that sparked around 1 a.m. According to Sandpoint City Administrator Jennifer Stapleton, the 100-year-old building on the corner of First Avenue and Bridge Street is a total loss following the blaze, resulting in between $4 and $7 million in damages. The building next door received extensive smoke damage as well, resulting in a church closing for the foreseeable future. Seven businesses total were affected by the fire. Following the fire’s suppression, city workers blocked off the streets adjacent to the fire, with Stapleton anticipating that flaggers will manage traffic at First and Bridge for weeks to come. A fire marshal is investigating the cause of the fire, and the city is bringing in a structural engineer to evaluate the full scope of the damage. According to Selkirk Fire, Rescue and EMS Chief Ron Stocking, Sandpoint Police Department is also conducting an investigation. No cause for the fire is yet identified. More than 40 firefighters responded to combat the blaze, according Selkirk Fire. That included five chiefs, 12 engines and two trucks, as well as responders from Bonner County EMS, Sandpoint Police Department and Bonner County Sheriff’s Office. Almost every Bonner County fire agency, as well as Timberlake, Northern Lakes and Kootenai County Fire and Rescue, assisted on the fire. According to Stocking, the fire resulted in no reported injuries due to the building being unoccupied at the time. Nevertheless, the incident posed a challenge for firefighters, Stocking said. It was snowing with a temperature of 11 F, and crews were still fighting fire by the time city officials hosted a press conference around 8:30 a.m. Around 4 a.m. the incident was declared a defensive fire due to the building’s structural degradation, at which point firefighters remained outside to fight the flames with water streams. Local residents by the hundreds took to social media to express shock and condolences to those affected by the fire. Likewise, owners who lost their businesses reported their sad news to their fans and patrons. Other business owners and organizations were quick to offer support. The Greater Sandpoint Chamber of Commerce reached out on its Facebook page. Eichardt’s launched a GoFundMe campaign to assist the business owners and employees who lost their livelihoods. To contribute, go to www.gofundme.com/for-businesses-affected-by-the-211-fires.